Music for Maniacs: Vote For Hyemen & Metalfunkel! Esta es a bueno posto. Muchas Gracias! Pero, el linko para El Hyemen & Metalfunkel es no worko... Cana you por-favor fixey it? I just checked el linko and it worked for me, amigo. Su computer had too mas tequila..? Need to get rid of the "#" symbol in the link before their name at soundcloud. This is some hilarious stuff, but very well executed. These guys are great singers, great harmonies. Hearing Tony Iommi's solo played on acoustic guitar was great! It's funny, because I've always thought a lot of Steven Wilson's harmonies were very Simon & Garfunkel-influenced. These guys can consider me a fan. Thanks Mr X, I've removed the '#'. hope that helps. Unfortunately, they need more fans than you and I, they're really losing now to the routine-sounding Lost Wheels. Probably stuffing the ballot box. Where's Jimmy Carter when you need him? 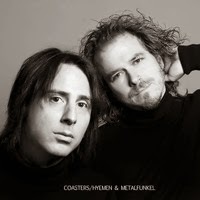 Love the Hyemem & Metalfunkel - are the tracks properly available anywhere? I have played Soundcloud rips before now...and will again, but I'd rather not! Hey Tim, I cannot find these songs available anywhere else. Attn: Hyemem & Metalfunkel, please make a proper release avalable soon!